Our 2nd Raffle Item to benefit the 2020 convention is a beautiful artisan handmade coin bracelet donated by VaCoinRings on Etsy. The bracelet measures 8" long and 1" wide with domed 1970's Kennedy half dollar coins and an adjustable clip. Or if you prefer, you can click the Buy Now" button below and pay for a 1 year subscription or renewal by Paypal. Be sure to check here for additional photos and information that go along with some of the past newsletter articles. Because space is limited we couldn't fit them all in the newsletter. This page is for our members only. It includes access to the club's quarterly newsletters. You can read them online or download each pdf to your computer. 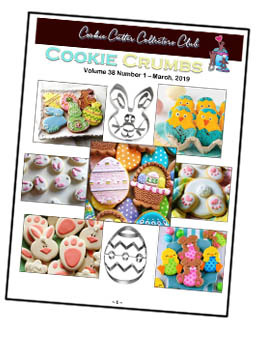 cookiecuttercollectorsclub.com to receive the current ID and password. The digital version has all color photos and is available to you a bit earlier than the mailed copy. Plus you're being proactively green in saving trees and helping your club save money! Would you like to have your own CCCC business cards to hand out? The club can supply any member with a pdf file that they can then print out on a standard color home printer using preperforated business card sheets or blank 8½x11 card stock. Cards will be printed 10 to a page and must be cut apart. They will contain your name, a phone number and email address as well as the web address for the club site. Up to 6 lines can be printed on the front of the card. Back of card contains information on how others can join the club so you can give one to anyone who is interested. 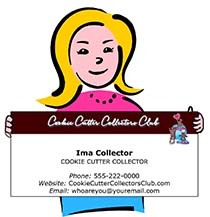 Send your card information to webmaster@ cookiecuttercollectorsclub.com to take advantage of this. If you do not have the means to print the cards yourself, we can also arrange to have them printed at a commercial printer for a charge.